There are very few foods that are so universally loved and so easy to make. So why, oh why, do we buy the flash-steamed-oil-sprayed french fries in the freezer department. They are just not good. Not good at all. Why not just grab some potatoes, oil and salt and have at it. That is all you need. For about the price of one bag of Gon-Ho (does anyone get that? I worked on it for a bit), you can buy a bag of potatoes and a bottle of oil to fry enough for a small army. What other three-ingredient recipe gives us that same eye-fluttering happiness. Grown ups and kids alike love the things. Vegan and burger-lovers can have a kumbaya moment over the little lovelies. While burgers are the standard go-with, these are terrific with steamed mussels; they’re de rigeur with a big bowl of zhudra and, my all-time favorite, dipped into a big thick chocolate shake. Salty, sweet, hot, cold, crunchy, creamy…. The only fond memories I have of my days serving the masses at a certain golden arched fast food joint was my lunch of choice which was a small fry and a chocolate shake. Solace amidst the horror … A brief glimpse: Breakfast shifts scared the hell out of me … Mainly because hash browns didn’t have the same pizazz as french fries with the milk shake (yes, I do know from experience) but also because the – ironically – after-church crowd were the most impatient, rude, hateful customers I had to deal with. They apparently left their godliness and love of humankind in the car while they came in to take care of their bellies. This was hotcakes and scrambled eggs served in Styrofoam, folks! They would huff, puff, yell … aarrggh… A moment please… And this is why I am a terrific customer, I don’t care if it’s spicy rice takeout or a shwanky 10-courser, you service industry folks have my sympathy, patience and kindness. But I digress. French fries are fab. Making your own will make you popular with everyone within nibbling distance. Three ingredients, a little patience, and your efforts will be rewarded. A bonus if you have any left over (as if … ), they can be stored in the fridge or, gads, freezer and then re-crisped in a very hot (think 450) oven for about 5 to 10 minutes, depending on how cold they were to start. So, here goes. My recipe is the generally accepted two-step cooking method give or take a few degrees. Best french fry potato is the Russet. If you use new potatoes or other less-firm fleshed, they’ll disintegrate in the oil. First step is to scrub your potatoes if you are going to keep the skin on and, well, why wouldn’t you? Then cut into the thickness of your liking. This batch was for zhudra so I cut them rather thick. Do thin if you’re dipping into a shake for best sweet-to-salty/creamy-to-crisp ratio. Put your your potatoes in cool tap water and let soak for at least two hours though preferably four in the fridge. Some say up to eight hours but I just don’t plan that far ahead. Anyway, this soak time removes some of the surface starch and helps give the crispy texture. 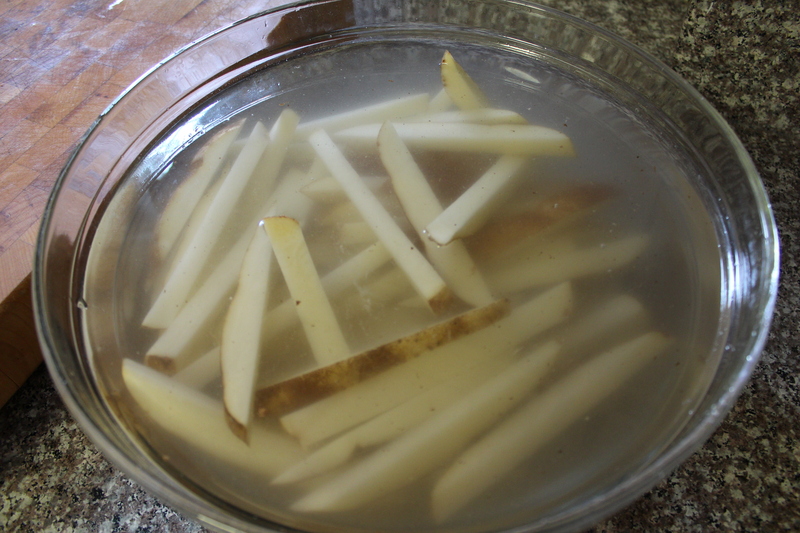 Drain and thoroughly pat dry the potatoes before even thinking about putting these sticks o’delight into the oil. Water plus hot oil is very, very bad. I’d show you a pic but that’d just ruin the beauty that is the french fry experience. Simply heed my stupidity. Into a heavy-bottomed high-sided pot, clip a candy thermometer and fill to cover the bulb with oil. I have used half peanut and half canola for this batch since that’s what I had on hand. Peanut is great for flavor and because it has a high smoke point (meaning it doesn’t smoke unless you’re at a heat that you probably ought not be for safety’s sake). Olive oil is not recommended; its flavor is assertive and smoke point low. Over medium heat, get the oil to 325F and maintain (you may need to go a bit above or below medium – I’ve got a gas stove so it’s really easy to keep a steady temp). Once you get to 325, delicately, delicately, put a generous two-handful of potatoes into the oil. You don’t want to overcrowd … potatoes should be in a single layer. Fry for about 3-4 minutes until pale and limp (this will depend on thickness so go with appearance – limp with no browning). (Above) … this is why you need a high-sided pot. The potatoes will make the oil seem to grow. While they are cooking, gently stir them around. Make sure you are maintaining 325F, or as close as possible. Don’t freak out if the temp dips at first; it should come back to temp pretty quickly. If not, jiggle your controls to adjust. Cool tool note: I love my spider; it works great for herding the floating starch sticks and straining off the oil. Whoa, bad zoom. After 3-4 minutes, when the potatoes are limp and still pale, remove from the oil – shaking off excess oil back into the pot – and hold in a heat-proof container. Some people put them on paper towels; I don’t. It’s a preference thing and since it’s going back into the oil, I haven’t noticed the difference. Plus I hate when they stick to the paper towels. After you’ve gotten your potatoes through the initial howdy-do with the oil, increase the oil temperature to 375F. Once you’ve got the temperature maintained, place a generous handful (this time I’m using a spider) of the first-cooked potatoes gently into the oil and cook for 3-4 minutes, stirring once or twice to keep them separated and cooking evenly. Okay, maybe four or five times … but gently. Repeat as needed. When the fries are your version of the color of perfection, remove from oil – pausing to let some of the oil drain back into the pot … you DO have other potatoes to think of! Put the french fries onto paper towels to absorb the excess oil and immediately salt … toss a bit to get them all flecked. And then take this moment to enjoy your very first batch, savoring the crunch, the potato-i-ness, the salty creaminess… the joy that is three ingredient perfection … Sigh …. and then prepare for the attack for once people get wind there are homemade fries, you will have company in the kitchen. Enjoy while they are hot! Plain, with ketchup, with zhudra, with a flavored aioli …. with a chocolate milkshake … hiding in the pantry with a fan blowing so nobody can smell what you’re up to … Ah, I kid on that last one. In any case, please do give these a try. Bonus, if you hate the smell of fried food, we’re now into Fall so you can open your windows; but be warned the neighbors will know what you’re up to. Scrub the potatoes. 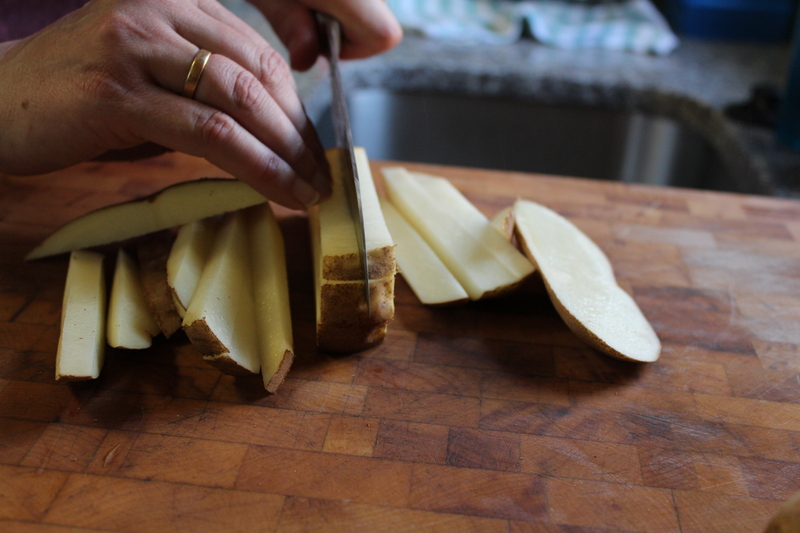 Cut lengthwise into slices, then cut each slice lengthwise into fries. Be uniform in size – from steak cut to shoestring – choice is yours. 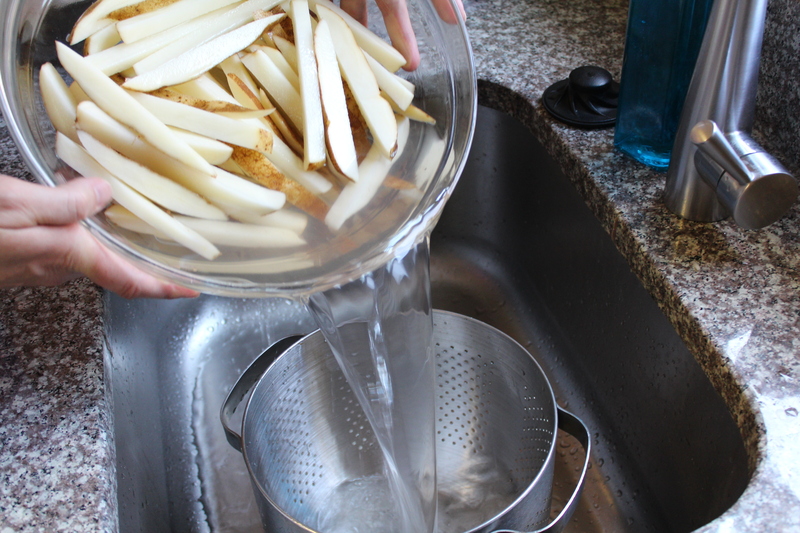 Put the potatoes in a large bowl of cool tap water and refrigerate for at least 2 hours, up to four. Get all of your equipment in place: high-sided pot on stove with candy thermometer; heat-proof pan (I used Pyrex) to receive first-cooked potatoes, a spider or other straining tool, second pan or bowl with paper towels to receive finished fries. Heat the oil in the pot over medium heat to 325° F. Once the temperature is steady, fry in single-layer batches for three to four minutes, stirring frequently and gently, until the fries are limp but still pale. Remove with a spider or some other skimmer to the first heat-proof tray. Once all of the potatoes have had their first fry, Increase the heat of the oil to 375° F.
Fry the potatoes again, in small batches, stirring gently and frequently, until golden brown to your preference, 3 to 4 minutes. Remove with the skimmer and drain on clean paper towels. Season immediately with salt and serve hot. This entry was posted in Side Dish, Vetegarian and tagged burgers, deep fry, delicious, Dinner, family, french fries, fried, fun, fun in the kitchen, ketchup, kid friendly, kids, mayonnaise, peanut oil, pommes frites, salty, Side Dish, zhudra. Bookmark the permalink.